The impact of the cyclone and the destruction it wrought took lives, annihilated settlements, displaced survivors and led to the loss of productive assets and housing. 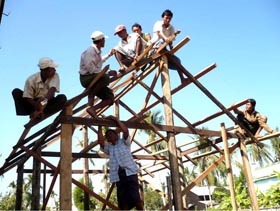 In total, approximately 450,000 houses were completely destroyed while 350,000 houses were damaged as a result of cyclone Nargis which struck on the 2nd May, 2008 in the Delta of Myanmar. Many of the structures built are inadequate, unsafe and unable to provide sufficient protection to affected households. The Shelter Improvement and Disaster Risk Reduction Project objective is to enable vulnerable households to bring about critical improvements to damaged houses and to increase knowledge of Disaster Risk Reduction at the community level. Communities were provided with ‘community mobilization grants’ which needed to be used based on project criteria. 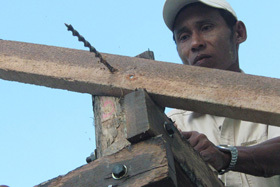 20 Carpenters from 10 villages were trained in DRR construction techniques. 20 Carpentry kits were distributed—one for every trainee.